For all the details, visit TipNut. 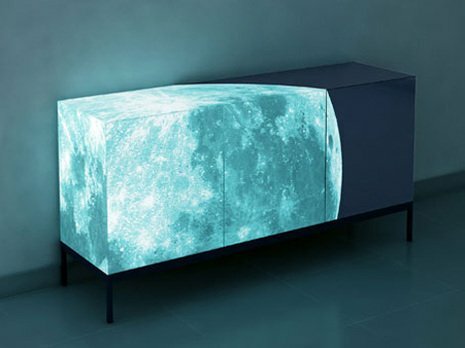 Glow in the Dark Moon Table. Check out this quick and easy Ikea hack. The maker used a Grundtal Towel Rail ($7.99) and added a piece of openwork steel on top and a few hooks below, making a handy and stylish kitchen shelf. Via Instructables. How To Fold A Paper Box. Use these adorable handmade paper boxes for storing small parts, office and craft supplies, or for gifts. 1. Fold the paper in half, extend it back out and then fold each half inwards again to end up in the middle line. 2. Turn paper sideways and do the same exact thing as in step 1. But this time after the second fold, fold back out again and straighten the paper. I love this idea: storage containers made out of recycled paper. The colorful strips of paper ‘are hand-stitched to form the perfect fabric for today’s world.’ The , the 15" x 23" hamper will set you back 80 bucks, the magazine basket 35 and the storage basket 25. Now, if you’ll excuse me, I’m off to investigate paper sewing techniques. B & B Italia’s Soft Wall, designed by Gerhards & Glücker, is a room divider, space definer, sculpture and storage unit. How’s that for multi-functionalism? Crafted of felt on a metal frame, the wall provides pockets for all those magazines, brochures, invitations and such. An added bit of news: B & B Italia has taken up shop in the U.S. in SoHo at 138 Greene Street as of March 07. Question: What sound would be created if an iPod could pinch off a dookie? Okay, not really. The Iplop happens to be a miniature beanbag chair for your accessories such as iPods, PDAs, keys and such. A waste of cash? Probably. But at $4.99 each, they aren't THAT big of a waste. You can find Iplops, available in a variety of colors, at your local Officemax stores and online at Senario.com. Have an apartment or older home with no entry closet? Check out Stacks and Stacks’ Entryway Organizer. At 16 inches deep and only $189 bucks, it is a great alternative to the cumbersome and pricey armoir. Available in two styles, these cubbies may be just what you’re looking for in stylish storage. This innovative coat hanging system caught my attention: totally organic and self-assembled, and looks way better than those bras-plated things you get at the hardware store. It's for sale at the Cooper Hewitt Museum Shop (although apparently not yet on their online store).